The Ladies Diamond Conquest models combine the brilliance of precious stones with the strength of ceramic in black and white. The dynamic beauty of those models, achieved through a marriage of sporty design and glittering diamonds, echoes the fine balance between performance and elegance. Sporty women who appreciate elegance will find exactly what they are looking for. The Ladies Diamond Conquest models are aimed at those women who enjoy sport but are not willing to compromise on elegance. 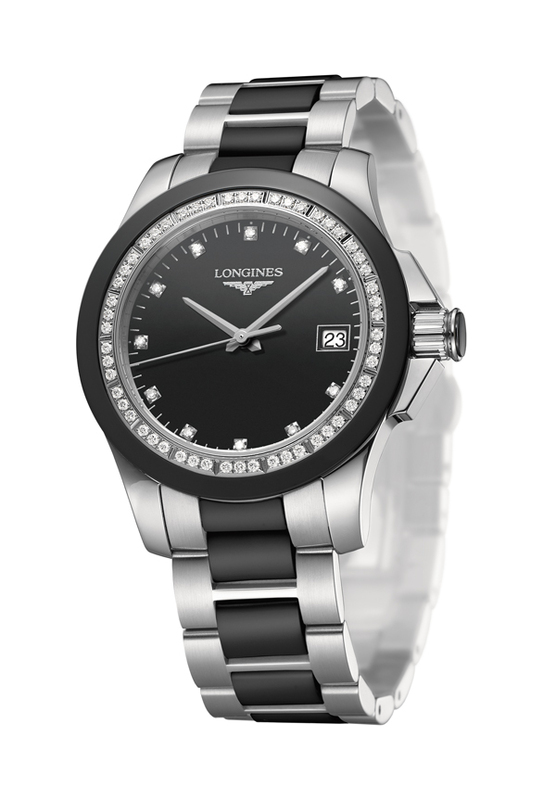 Thanks to the use of diamonds and the innovative combination with ceramic, these models add a touch of sophistication to the sporty beauty of Longines’ range of products. With its delicate balance, the Ladies Diamond Conquest watch is the ideal timepiece to weapon many occasions; during an equestrian competition, a tennis tournament or while having fun on the ski slopes, but in the same vein it will add a touch of elegance worn for a cocktail party or a formal dinner. These glittering timepieces boast a dynamic beauty which has been achieved by the use of ceramic embellished with 54 Top Wesselton VVS diamonds set around the inside of the bezel and on the dial. The bezel and the bracelet are reinforced by the use of white or black ceramic while the matching dial – white mother-of-pearl or black – completes the appeal of this model. The Ladies Diamond Conquest models have a screw-down case back while the crown has a lateral protection. They are water-resistant to 5 bar and the bracelets have a triple safety folding clasp. The stainless steel case has a diameter of 35 mm and houses a quartz movement that shows the hours, minutes, seconds and date. Thanks to their delicate balance between performance and elegance, these robust timepieces are ideal for women who enjoy sport but at the same time appreciate refinement. 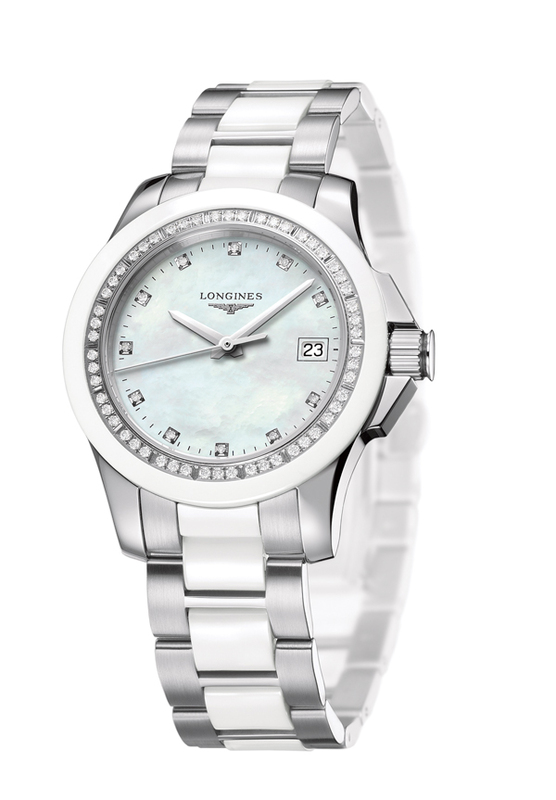 The Ladies Diamond Conquest models have added a new dimension to the Longines Sport Collection thanks to the inclusion of diamonds and the combination of these precious gems with the strength of ceramic.